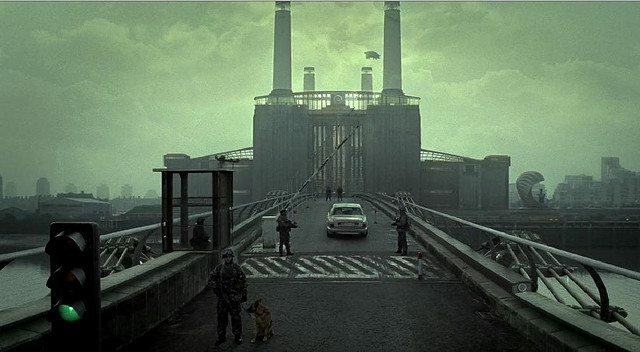 When I first saw the trailer for Children of Men in late ’06, I thought it looked like yet another standard issue end of the world action flick. I had no intention of seeing it. When it opened, the NYT gave it a nice review, but hell, it was Manhola Dargis writing it, and she’s hardly the most reliable set of eyeballs. Still and all, she made it sound good enough to see. The movie opens on a black screen. The voice of a TV newscaster sets the scene of the state of the world: the siege of Seattle, the army occupying mosques, British borders closed, and the lead story: the world’s youngest person, eighteen years old, has been killed outside a bar in Buenos Aires. Cut to a group of coffee shop patrons staring at a TV. Pushing through them to the counter is Theo (Clive Owens in his best performance), more interested in his coffee than the news. The camera follows Theo out of the shop into the futuristic London of 2027, not a shiny, glossy science-fiction cliché future, but a dirty, lived-in one. It’s the present, skewed. A strange couple of vehicles drive past as Theo sets his coffee down to add a shot of whiskey to it, the camera pans around him, the coffee shop now in the background—and a bomb blows the shop to pieces. Theo stumbles away from the blast. From the smoking ruins a woman walks out, holding her blown-off arm. And then back to Theo, heading into work. At this point, sitting in a theater on New Year’s day, I was hooked in a way I hadn’t felt hooked by a movie in ages. He achieved this goal so well I think it was too hard to watch for many people. How does one brief opening scene grab me the way this one did (and still does, every time I watch it)? It’s not something specific. 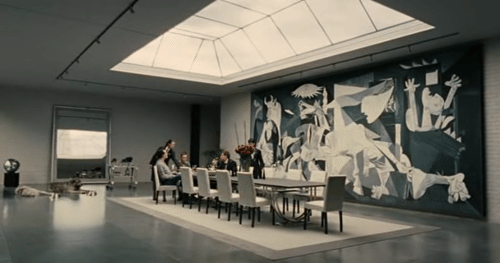 It’s a combination of elements, the actors, the camera movement, the production design, the feel, all of which is fully realized in these opening moments. This is one of those rare and beautiful movies where the creators went to the trouble of considering every detail of their world, and despite many of those details existing only in the background, in the periphery, and for the audience often not even consciously, that those details do exist, that this world exists so fully in the minds of those creating it, is what allows even a single scene, even the first scene, to manifest the kind of totally encompassing impact that every scene manifests in Children of Men. The conceit of the movie is that for the past eighteen years woman have been infertile. As a result, the world has gone mad. No one discusses philosophically why this is so. It’s a given, as it should be. No matter that procreation may be in the background for many of us, or not important at all, to live in a world where humans are dying out and will soon vanish for good, and to have lived in that world for eighteen years, I think would have incomprehensibly awful psychic effects. What would anything matter? Isn’t all we do done knowing there will be others to follow us? You could argue that you’re going to die anyway, and that when you do, like the Bokononists say, you’re destroying the world, so what difference if, even out there beyond your own consciousness, the rest of the world is going to die too? I think it would make all the difference. I think it would send the world over the edge. 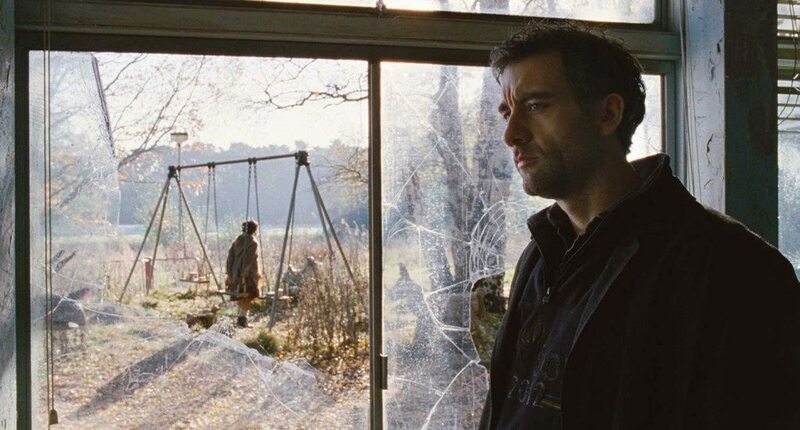 If anything, I think the madness in Children of Men is likely an understatement of the probable state of the world given the premise. Newspaper headlines, glimpses of televisions, throughout the movie these pop up showing the world in chaos: riots, fires, soldiers, journalists tortured, a mushroom cloud blooming over New York. A news promo proudly declares that despite the world going to pieces, “Only Britian soldiers on!” And Theo walks past soldiers and caged refugees awaiting deportation. They exit the Russian apartments, and the next shot you see is this woman wailing, holding the body of her son in her arms. This was a reference to a real photograph of a woman holding the body of her son in the Balkans, crying with the corpse of her son. It’s very obvious that when the photographer captured that photograph, he was referencing La Pietà, the Michelangelo sculpture of Mary holding the corpse of Jesus. So: We have a reference to something that really happened, in the Balkans, which is itself a reference to the Michelangelo sculpture. At the same time, we use the sculpture of David early on, which is also by Michelangelo, and we have of course the whole reference to the Nativity. And so everything was referencing and cross-referencing, as much as we could. The movie is about Theo’s journey from defeated indifference to hope. This is the theme: to have hope in the face of disaster, a disaster that reflects and magnifies the current state of the world. The war zones resemble current war zones. The prisoners in cages look like current prisons. In one panning shot of refugees is seen a hooded man straight out of Abu Ghraib. The movie takes the terrors happening at specific places around the globe—wars, terrorist bombings, deporting illegal aliens, government crackdowns, economic disasters—and spreads them everywhere at once. Is the ship at the end going to take Kee and her child someplace good? Or will they use her as everyone would have? 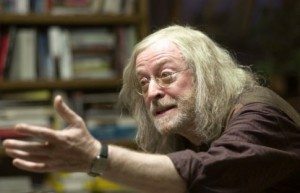 Does the Human Project exist as rumored, or are the stories only stories? When I first saw the movie I thought for a moment that we wouldn’t even see the ship, that we’d leave Kee waiting. I realize such an ending would tilt the equation too far towards hopelessness. The ship means something, yes, but what it means is up to the viewer to decide. Technically the movie is so miraculous I want to yank out my eyeballs and throw them at the screen every time I watch it. I think I’d been secretly dreaming for years of an action movie that didn’t use rapid fire cutting to create the “action.” This is the biggest crutch in the history of movies, as though more and briefer shots—and pay attention the next time you watch an “action” movie, see if any single shot is held longer than five seconds, or hell, two seconds—as if this barrage of images is actually saying anything other than “Hey! Look! Now! Yes! Here! Bam!” Editing is best used for a reason, and if your reason is, “If we do a lot of it, ‘excitement’ will result,” then you’re doing it wrong. Editing must be motivated to mean anything. …character is as important as social environment. That means that there are no close-ups, everything is seen from a distance and also we are trying to avoid editing seeking for an effect. Rather than that we tried to create moments of truthfulness and to have the camera registering that moment of truthfulness. The effect is almost one of having no central characters. Throughout the movie the camera wanders away from Theo to observe the surroundings. The city itself, the reality these people live in, becomes in itself a kind of character. 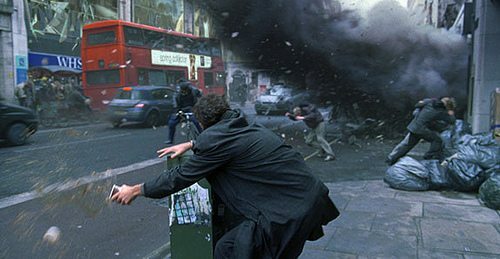 The most talked about single-take moments in the movie (in appearance; in fact these sequences were combinations of numerous takes put together to create this effect) are the attack in the car and the final battle in the refugee camp. Both are stunning. Best of all is that the first time watching the movie, you don’t even realize that you haven’t seen an edit in however many minutes. These single takes aren’t used to wow you for their technical cleverness, they’re used to pull you into the action, to in a sense make you forget you’re watching a movie, exactly the opposite effect of rapid cutting. My two favorite scenes aren’t those two. They’re two short, simple moments, also shot in single takes. The first comes after Julian’s (Julianne Moore) death. Our heroes are in the woods laying the body to rest. Theo walks into the woods, takes a drink from his flask, takes out a cigarette. Up to this point in the movie Theo has been emotionally absent from everything, from the world, from people, from himself. He helped out Julian because of their past, and to make some money. Suddenly everything is real, and Julian is dead. He tries to light his cigarette when he’s overcome by tears. He falls to his knees next to a tree. But they have to leave, he’s called back to the car. He stands, gets control of himself, and walks away. The second comes when they reach Theo’s friend Jasper (Michael Caine, completely great, who based his character on John Lennon). Kee and Miriam and Jasper are in the living room. Theo is in the kitchen when he hears them talking about him. The camera stays on Theo, who does nothing but listen. The other three are out of focus in the background, though they’re the ones talking. Jasper tells them about Theo and Julian’s son Dylan and how he died, and how Theo lost faith in doing anything for the world or for himself. It’s such an unusual way to shoot this kind of scene, and it’s so smart. The characters talking don’t matter. Theo is the one who matters. That he’s not with the others allows them to talk freely about him. And we in the audience stay with Theo to see how this reporting of his life affects him. He’s not there to argue with them, to correct them, to add his opinion. We just watch his face as he listens. Other moments: the deer running through an abandonded grade school. A kitten climbing up Theo’s leg. Slow pans across bureaus cluttered with photos and news clippings. The dreamy cut to Theo in a fancy car being driven first through the dying city and then into the walled off, well-kept grounds of the government on his way to the Ark of The Arts. “I was told to call you a fascist pig.” Theo and Julian on the bus, they’ve said but a few words when she tells Theo their deceased son had his eyes, and they turn away from one another, their eyes zoning out as memories of their son play out. 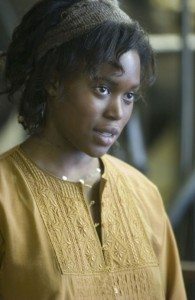 Theo’s reaction when Kee reveals that she’s pregnant: without saying a word, his face shows a destroyed man who in that one moment realizes he’s allowed to have hope. 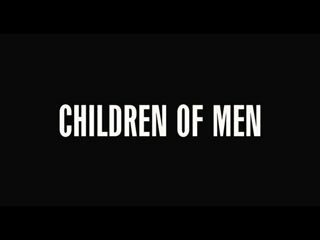 Children of Men is all beautiful moments. For a movie that contains so much, the story is simple, and there’s not a lot of dialogue. The images tell you what you need to know. The images don’t tell you what to think. They present a world disintegrating and, possibly, a glimmer of hope living within it. Children of Men, Pan’s Labyrinth and The Constant Gardener are my favourite three films of the 00s. Maybe City of God too. rewatched this recently with the Mrs.
i loved City of God too, but haven’t seen it since it came out. been meaning to watch it again. City of God is great; although I felt it lost some of its impact on second viewing. 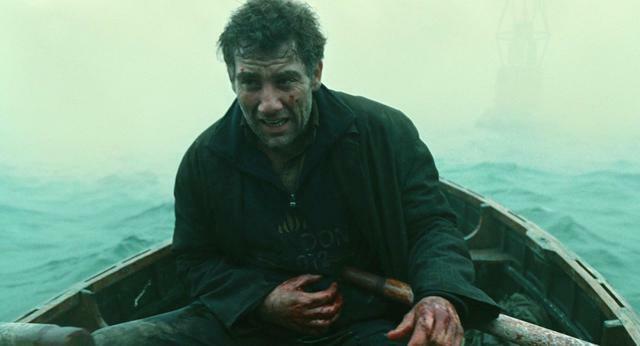 The Constant Gardener is under-rated but nowhere near Children of Men. 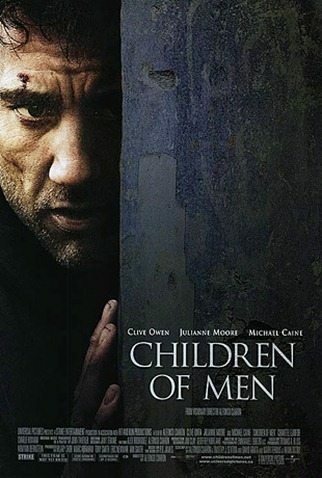 I’m not coming up with anything I liked better or appreciated more than Children of Men. Eternal Sunshine is pretty great. I’m also always up for watching the Incredibles, but that’s not the same thing at all. Also: Mulholland Dr. This film was screening on TV when I was thirteen. It made me paranoid, it freaked me out, but my eyes were locked to the screen. It’s incredible, constant shivering!